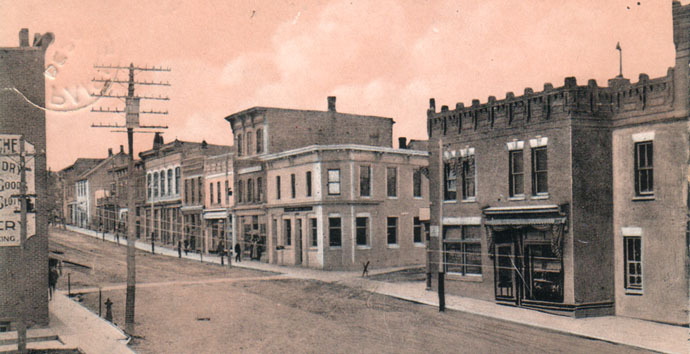 The founders of Paisley were Simon Orchard and Samuel T. Rowe, residents of Durham, Ontario, who, in the spring of 1851 came to Walkerton intending to settle there. 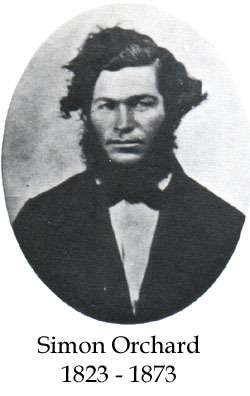 Rowe became involved in a building project in Walkerton, but Orchard, who reports having had a dream of rich lands at the confluence of two rivers in the area then known as the “Queen‘s Bush”, constructed a raft 30' by 15' of cedar logs, and with his family and household goods, including a large old family Bible on board, floated down the Saugeen River with no really fixed destination. On the first eve of their journey they made camp along the Saugeen at the mouth of the Teeswater River. In daylight, they were pleased with the surroundings and decided to settle there. They built a rude shanty, on the north side of the river, from boards they had brought on the raft. (The location was near the present site of the Baptist Church). Samuel Rowe arrived by raft at the same location a few weeks later. He cleared land on the south side of the river and built a cabin across from the present Town Hall. Surveyors working northward from the Durham road, and locating the Elora Road, came to the spot where Orchard and Rowe had settled. A log building was erected near the hotel site and became known as Rowe's Tavern. Unusually high water in June 1851, carried away the foot bridge over the river. The only communication between the two families was by means of a dog “Danger” which carried small articles and messages back and forth across the high water. Progress was slow, but after the Land Sale at Southampton in 1854, progress was so rapid that by the end of 1855 almost every lot in the surrounding townships had been taken up. In 1856 Orchard and Rowe obtained a patent from the Crown, and the village was surveyed. 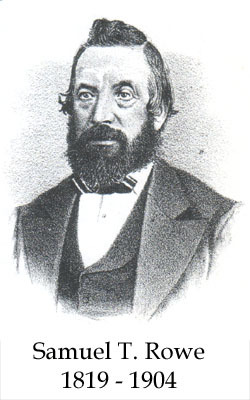 In February 1856, the first post office, with Thomas Orchard as postmaster, was opened. The village was named Paisley after a town in Renfrewshire, Scotland. A spot in the wilderness had been transformed into a busy community with many thriving industries. 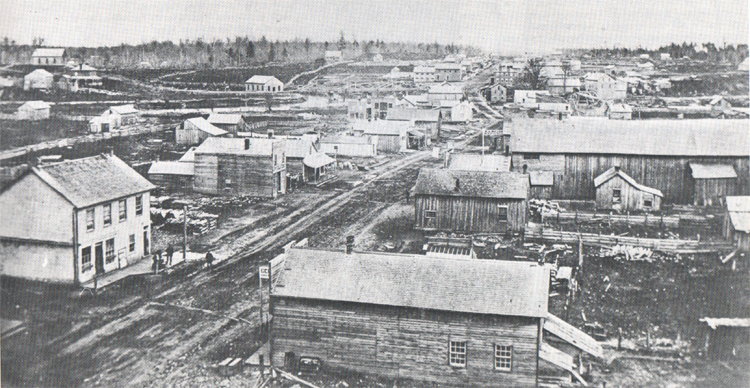 Within a year after the first locomotive chugged into Paisley in June 1872, the village had 1038 inhabitants. Not long after Simon Orchard settled here James Walker and his bride Janet Fisher Walker made their Way into the newly opened territory. They came by train to Galt, drove in a wagon as far as Durham, walked to Walkerton, and got a chance ride to Dunkeld. Here they were met by a cousin Mr. ].C. Mclntyre of Elderslie Twp., who walked with them back to Paisley, to pilot the way through the bush on a blazed trail. When they arrived at Paisley, they built a log house, the first one on the north-east side of the Saugeen River, in the village. This street is now known as Goldie Street. To get across the river they had to use a raft and a pole. In 1858, a daughter was born, Catherine Walker who was the first white child christened in Paisley (according to Mr. W. Cameron's records). Little development had taken place here, and the struggle for livelihood in the settlement on the banks of the Saugeen and Teeswater Rivers was hard and never ending; but the pride of possession of their own land, and the love of their young family, now two children, compensated for the hardships and privations. James and Janet dreamed of a bright and happy future in the new land for their children. Then tragedy struck the home as James Walker died after three short years, leaving his widow with a young family. Her world may have fallen apart but Janet Walker had no time for grieving. With small mouths to feed, she looked about her for a means of livelihood, This land of hope had little opportunity for a young widow and mother. Most of what development there had been in the village was to the west of the Saugeen. There was a bridge over the Teeswater River but the Saugeen had not been spanned. But with new homes being established on Knox Hill (Goldie Street) and Elderslie Twp. being opened up there was a limited traffic from the east. _Ianet Walker saw that need and set up a ferry service by row boat across the river. There was a bell on the bank of the river and when people wanted to get across, they would ring the bell and Janet Walker would come down the bank to take them across. One can picture her, proud and defiant, bowed by physical burden (using only raft and pole as her equipment), but with spirit unbroken, polling her craft across the Saugeen River. How long she operated the ferry is unknown but her intrepid spirit enabled her to keep her home and family together. 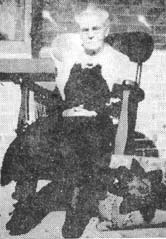 Some years later she married William Houston, and went to live on his farm in Greenock Twp. This narrative is just one of many which could be told of those sturdy pioneers, who came i.nto the bushland and hewed from it this Paisley and the rich farmland that is our heritage. By the late Mrs. Duncan McGregor and published in the Souvenir "Bridge" Book in 1935. It was in the year 1868 that I came with my parents, the late Mr. and Mrs. Henry Collins, who located on a farm just north of Paisley. Being in the local school section, we children attended the village school, and thus had a golden opportunity to observe the activities among the residents. Paisley, at the time of our arrival, was a rapidly-growing village, and varied were the callings of the tradesmen and workmen, who, upon deciding to locate here, erected buildings to house their respective businesses. There were three churches in the village - the Anglican, the Methodist Free Church, and St. Andrews, the latter more commonly termed “the Kirk". Then there was Miss Armstrong's private school, and this estimable lady also taught music. Next door was Mrs, Whittle's candy store, and all down the street was a row of fine shops. Bruce's general store was destroyed by fire the spring we arrived here. Over the Teeswater river was a wooden bridge, and the roadway on either side became a great' sea of mud in the rainy weather. The sidewalks, if they may be called that, were a few planks placed here and there. See Picture below of Queen Street South where Bruce's General Store is second from the left.. There were two woollen mills in the village in those days. One was located in the large brick building at the south end of Teeswater Bridge, now occupied by Clark's butcher shop and Ellis' barber shop. The other stood on the bank of the Saugeen river, near the end of Water Street. John Murdoch was the builder and proprietor of the latter, but later sold it and purchased The Advocate, which he published for some time. Also on Water Street were located Samuel Steele's wagon shop; Alex Colborne‘s harness shop. Lawyer Malloch's office was where the Baptist parsonage now stands, and just east of this was Peter Sinclair's cooper shop. Other tradesmen in town included shoemakers, blacksmiths, wagon makers, cabinet makers, photographers and many others. At that time the foundry was employing about 40 or 50 men, turning out all kinds of farm implements. And we must not forget William Hornell's bakery, where was produced excellent bread, while the specialty was old country Scotch ginger-bread. There were four hotels, one of them being Sergison's log tavern, later replaced by the brick building which is now occupied by the Paisley Creamery. In speaking of the Hanna House, built by David Hanna, we recall the small steamboat which Mr. Hanna and others had constructed for operation on the Saugeen River. The wharf for the little steamer was on the north bank of the river opposite the Baptist Church at Blackburn and Sinclair's sawmill. After the fair buildings and racetrack had been constructed, the steamboat made trips up the river to the new park, enabling passengers to take in the exhibition. The fare was 10¢. At other times moonlight excursions down the river were run, and the Paisley brass band was always on board to provide gay music. How well we can recall those village cows, each of which invariably wore, strapped about its neck, one of those cow bells, and how irritating it was to be awakened before dawn from a deep sleep by the brassy clamor as the kine moved about the village in search of breakfast. Or perhaps the pigs kept by Archie Stewart would break from their pen, and in the morning your garden would be “beautifully” plowed up by the busy snouts. And now I have lived in Paisley for a great period of time-from a small girl to a great-grandmother. I have seen the ups and downs of the village, and the advance of progress, which is so well illustrated by the fine new bridge just opened in the village - another bright paragraph that will go down with the ages. Time is surely marching on. Alexander McMorran and his wife, with their family of two small children, left Magherascouse, County Down, Northern Ireland in 1848 to emigrate to Canada. They landed at Toronto, then known as “Muddy York", and continued on north to Richmond Hill, where they operated a hotel. There, in 1854, they buried their oldest daughter, Mary just five years old. Now, with four sons left, the mother declared that a hotel was no place to raise a family. John Megraw, a cousin, had already settled in Bruce County and Alexander McMorran set out from Richmond Hill, on foot, into the “Queen‘s Bush” in search of a new home for his family. He took up land just west of Paisley, built a shanty, and returned for his wife and sons. With all their belongings they reached Walkerton. From there to Paisley, their means of transportation was a scow. It must have been a perilous journey down the Saugeen River from Walkerton to Paisley! Several of the articles that they brought with them are still in the possession of the family; a captain's chair from the hotel in Richmond Hill, a Seth Thomas clock, which operates with weights which must be wound each day, and various other articles. And wished to know where Paisley stood. Near the banks of the river my first homesteading began. It was a beautiful place to the young mind free from care. The log shanty beneath the greenwood trees, the mysterious working of the new sawmill, the twinkling light from the neighbouring sugar camp, where youth and pleasure often met around the midnight fire to sip the syrup or imitate the owl; these were plea good enough for me. But there is always the dark side of the picture, too. A shortage of bread, bad roads and no bridges were common difficulties. Cash might be plentiful but there was nothing to buy. During these days one ingenious fellow is said to have developed a plan to get a share of the current coinage. In the middle of the road he made a mud-hole, a trap for the emigrant's cart. A fee was imposed to pull it out ..... ” During his lifetime the pioneer recalled many anecdotes about the early days. One tale he loved to cell concerned a trip, made on foot, to Walkerton by his father. On this trip he was driving home a cow and a pig. Due to the fact that the animals did not travel well together, it was a tedious and aggravating journey. The cow would be persuaded to travel along the road, and the pig would wander. Then, he would manage to get the pig in line, only to discover the cow had strayed. Added to his problems, he also had a tiny kitten in his pocket. Among the supplies he brought home with him was an apple - the first one they had ever seen. It was divided into enough pieces that each had a taste of the treat. The pioneer generation has all passed on, but many descendants are scattered throughout Canada. We can be proud of our pioneer ancestors. Let us remember them, and pass on to future generations a feeling of pride in their heritage. Submitted by: Mrs. George Dietz (Lauchena Blue), Wellesley, Ontario. As I grew up in the north (low) end of the village, naturally my recollections are mostly of the people who lived and worked in that part of the community. Two brothers, John and Joe Chase owned and operated a mill east of Ross Street. The old mill race can still be seen, and it provided a popular swimming hole for years. The Raineys lived on the property now occupied by Mrs. Isaac Beech. Ida Rainey became Mrs. Joe Chase. John Barclay, who lived on Ross Street, was a weaver by trade. In later years his widow married Alex Blue, senior. The Sandy McDonald family lived three houses east of the Baptist church on Church Street. This house is no longer there. Next door, west, in the house now occupied by Gus McArthur, lived the Schmidts. He operated a cooper's shop (made barrels). Later on the john Shaws occupied this house. Mr. and Mrs. Richard Stair and family lived in the house now owned by Mrs. Effie McArthur. Richard's mother lived next door to us, now Mrs. Jean Skinner's home. In the early 1900's Palmateers lived in this neighbourhood. Blacksmith shops were popular in the olden days. Where the Community Centre now stands, Joe Bailey had a blacksmith shop. After his death Joe Hoath and his brother took over the business. James Brown was in partnership with Hoath at first, then later ran the shop himself. The next occupant was Percy McGillivray. My father, Lachlan Blue, and his apprentice, a cousin, Angus Blue were blacksmiths in the building recently torn down at the north side of the Community Centre. After my father‘s death in 1899, Duncan McGregor continued the business with his apprentice Jack Smart, who later took over the business. Wilfred Dudgeon was the last blacksmith to operate in this building. Archie Campbell, who was married to my great aunt, had a blacksmith shop in the south end of the village where the residence of Alf Sawyer now stands. They lived in the apartment above the shop. About 1904 they left for Dawson City and in letters received from them, there was often a small nugget of gold rolled up in the letter. A bakery, in the Stewart Muir building, has a personal memory in that the baker, Sam Lindsay, gave me one bun on my eleventh birthday! Another old business in a frame building which stood where the Bruce Telephone office was later built, was the tobacco-bookstore of Abe Stevenson and his daughter Nellie. Another daughter, Mrs. Allen, worked in a drugstore in Toronto where she sat in a show window displaying her beautiful long hair as an advertisement for “Seven Sisters” hair tonic. I have been told that in the house now occupied by Miss May Boyle there was at one time a bakery. The baker is reported to have kneaded the dough in a vat with his bare feet. Saugeen River with the Agricultural Fair Grounds Palace and Stock Sheds to the right. One of the outstanding memories of the year 1874 is being taken to the first circus I ever saw. In that year and in a locale like Paisley, the possibilities of a large attendance at such a performance did not exist. No great free street parade including elephants, camels, zebras, horses, hands, clowns, caged wild animals, and a calliope playing “There'll he a hot time in the old town to-night", etc., as of later years. No, indeed. As I remember it now after 75 years, the circus organization had only one animal, a pachydermatous quadruped of Africa, a rhinoceros. It was chained to the centre pole of the tent. The grounds, in those days, were known as “Thompson's Flats", and were located on the north bank of the Willow Creek, west of Laidlaw's foundry, I have no recollection of any band, high-wire acts, clowns, peanuts, popcorn or pop. The incident that follows is my one and only recollection of that evening. My aunt Maggie Scoffield, later Mrs. Moffat of Cargill, was being escorted to the circus by Matt. Daniels, who at that time worked in my father's shop, and I was included in the party. We had seats in the top tier of the limited accommodation provided. It was neither high nor luxurious. A panic was created when the rhinoceros presumably broke loose from the pole, and there was a stampede for the one exit. Below us on the bottom tier sat Mrs. G.W. Malloch. She had her black silk dress and hoop skirt torn by the horn of the rhinoceros, so I was told. In the moment of excitement, Matt Daniels grabbed me and dropped me to the ground against the canvas. Aunt Maggie and he followed by the same route, and we made our exit by ducking under the lower edge of the tent, and avoided the jam of the rush for the lone exit. We learned afterward that this “incident” was created with intent by the employees of the circus with full approval of the management, in order to give the pickpockets an opportunity to reap a harvest. Several of those who attended the performance afterward reported the loss of their wallets during the jam at the exit.